If you are attending an important job interview, going for an evening out, or if you just want to dress smartly or formally for any other occasion, you are probably looking for a good pair of dress shoes. If you have plantar fasciitis, finding the right dress shoes for you can be a problem. This condition can leave the feet feeling very painful and the wrong pair of shoes will only add to the problem. This guide looks at the best women’s and the best men’s dress shoes for plantar fasciitis as there are plenty of dress shoes on the market that have been designed with this condition in mind. 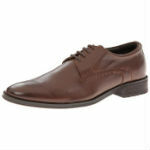 You can enjoy comfort and support as well as being able to wear a dress shoe that will be sure to impress. We are sure that you will find the perfect dress shoe for your outfit amongst these great choices. These attractive, yet practical dress shoes are a good choice for those who suffer from plantar fasciitis. 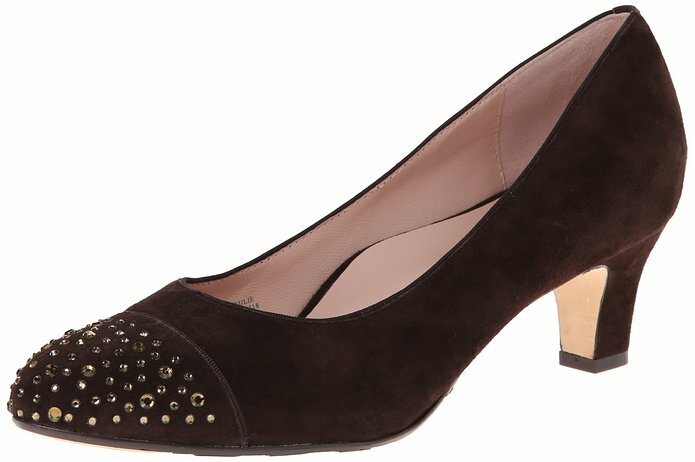 The Naot Women’s Luma Dress Pump features a low heel, which can bring you all the femininity and form of a standard heeled shoe, although the shoe has been designed to eliminate pain as much as possible. The rubber sole absorbs impact to be as gentle as possible on the soles of the foot, and the upper material of the shoe is durable leather. For strength and flexibility, this shoe features hand-sewn construction rather than glues or similar bonding techniques. To make this shoe good for those suffering from plantar fasciitis, the heel features a metal shank for support. At the front of the shoe is a supporting strap that keeps the shoe fitting snugly on the foot. This helps to avoid the repetitive movement and the subsequent pain that is characteristic of plantar fasciitis. These pretty dress shoes feature a very slight heel. If you’re looking for a pair of good dress shoes for plantar fasciitis that are flat, you should definitely consider these Vionic by Orthaheel Sophia Flat Shoes. The uppers of these shoes are made from synthetic leather and synthetic linings. The soles are flexible and have a patterned tread. They will ensure that you won’t slip whilst being lightweight and comfortable to wear for long periods of time. 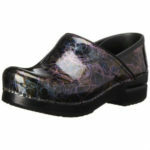 The orthotic design of the soles of these shoes has a supportive and contoured design that will keep your feet aligned. Your well-aligned feet will also ensure that your lower legs and hips feel less of the strain that they may have previously felt due to your plantar fasciitis. A strap across the top of these shoes keeps them securely on your feet without them slipping off whilst a supportive back keeps the shoe snugly fit to the back of your heel for additional comfort and support. 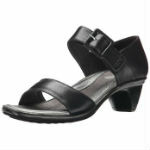 These Vionic Lydia Women’s Demi-Wedge dress shoes look professional and feminine. They are also highly effective at helping ease the symptoms of plantar fasciitis. The leather uppers add luxury and sophistication and you’ll appreciate the comfort of the demi wedge design. Because there is no separate heel, you foot will feel as though it is well supported, and an orthotic foot bed ensures that your feet are kept perfectly aligned. This will reduce any foot pain and help you to develop a better posture and foot alignment when walking. The soles of these shoes are flexible and provide traction to prevent slipping. You can comfortably walk around in these shoes all day without feeling discomfort. The high back supports your heel, whilst the ballet pump style toe keeps these shoes on your feet without the risk of them slipping off. 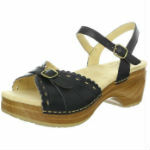 These wedges are a classy and comfortable choice in dress shoe that would suit most wearers. These traditional loafer shoe style dress shoes are a practical and professional choice that would make a great accessory for everyday wear. They are flat and have an ergonomic design that can help those with plantar fasciitis. These classic Vionic Sydney Women’s Leather Loafers have a signature metal trim across the front of the shoe and a shorter vamp design. 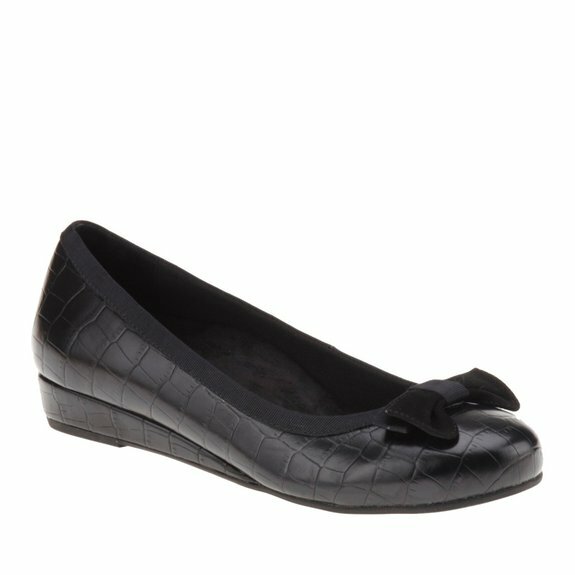 The flat sole of these shoes has a specially contoured insole that is padded for extra comfort. The out sole is made from durable yet flexible rubber that is lightweight and provides plenty of traction to avoid slipping. The foot bed helps to align your feet properly and support the heel, which is important if you want to reduce any foot pain and additional symptoms of plantar fasciitis. 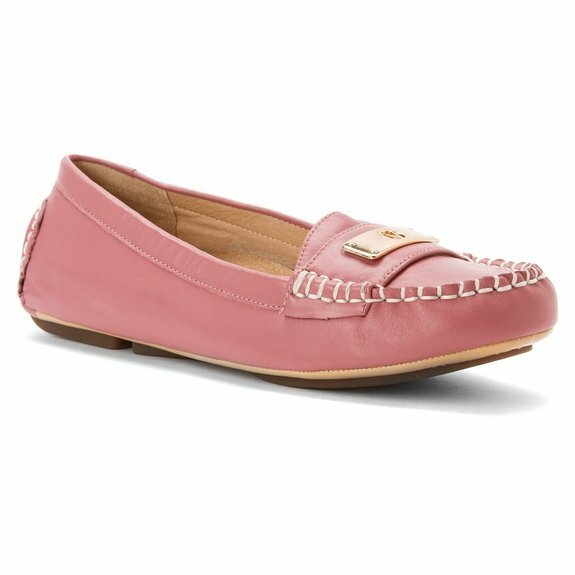 The leather, calf hair upper material gives a great look to these shoes and the variety of colors that you can choose from offers all the modern appeal that a girl could ask for. 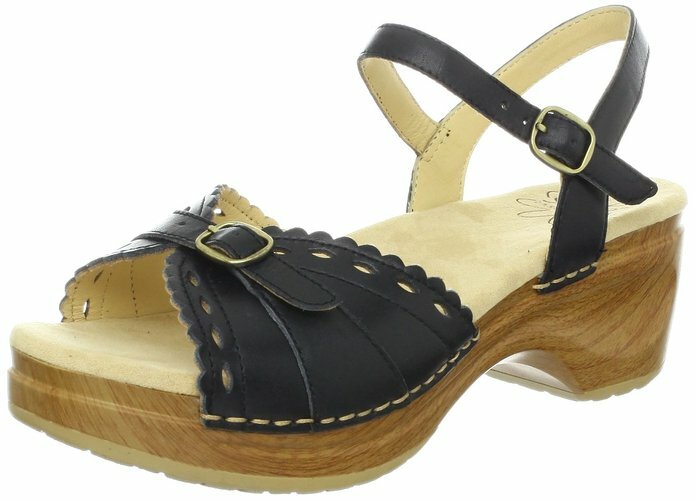 If you want a flirty and attractive summer shoe that will be suitable for plantar fasciitis symptoms, you’ll love the Sanita Women’s Dawn Platform Sandal. This pretty sandal has leather uppers for luxury and features a strappy design. The sling back heel and the ankle strap keeps these shoes firmly on your heel, whilst the adjustable toe strap keeps the sandal secured at the front. To give the illusion of a higher heel, these sandals have a slight platform to the sole. Between the heel and the toe part of the sole is a thicker portion that offers more support than regular heeled shoes. The wood look soles have a durable rubber outer sole that provides good traction and prevents slipping. To alleviate pain felt in the foot as a result of plantar fasciitis, these shoes have molded foot beds that give your feet support and encourage proper alignment. You should be able to comfortably wear these shoes all day without experiencing pains. 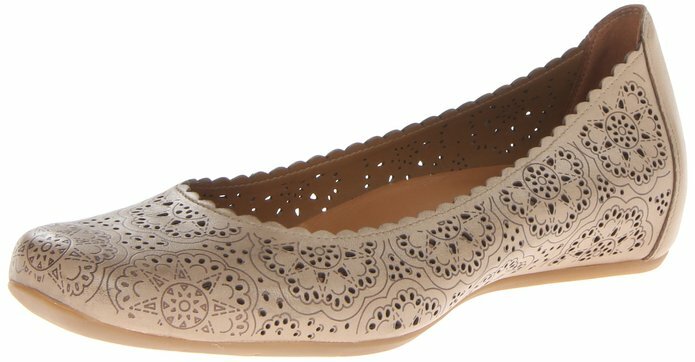 If you’re looking for a feminine flat shoe that you can wear for formal or even every day occasions, you should consider the Earthies Women’s Bindi Flat dress shoes. The patterned nubuck uppers not only give these shoes a great design, but it also allows your feet to stay cool whilst walking around all day. These shoes slip on easily and the high back design ensures that they stay comfortably on your feet until you are ready to take them off again. The lightweight but durable rubber soles prevent slips thanks to the increased traction that they provide whilst the foot beds offer you support and comfort. A cupped heel in the foot bed keeps your heel steady whilst you walk, whilst the raised arch supports the mid section of your foot and keeps it aligned. These shoes can reduce any pains that you may experience due to plantar fasciitis. 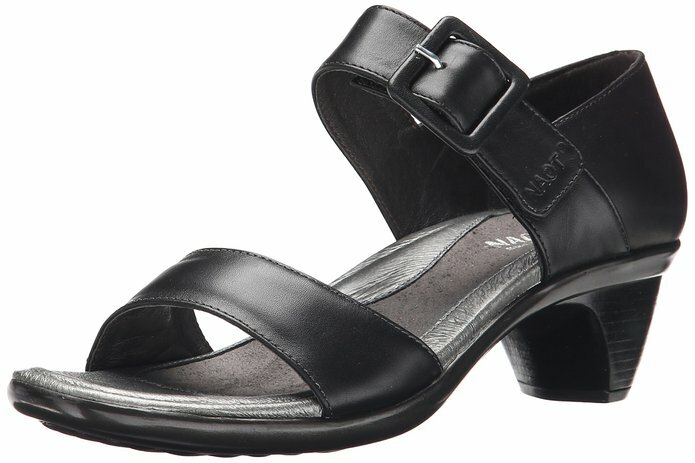 If you’re looking for a fashionable sandal that you can wear when going out or as a professional alternative to colder weather shoes, these Naot Women’s Future Wedge Sandals can bring all the femininity that you need. The 2-inch heel is feminine but not too high as heels that are much higher than this are not comfortable for those who suffer from plantar fasciitis and are possibly the best womens dress shoes for plantar fasciitis. The sandals have a faux buckle design that hides a hook and loop closure to allow for easy fit. The dressy look of these shoes makes a good impression, but they are so comfortable that you will forget that you are wearing a 2-inch heel. The strap to the front of the sandal is padded to provide you with additional comfort and to prevent blisters. These sandals have a narrow to medium fit that may not be suitable for those who have wider feet. These modern dress shoes are perfect for the workplace or when you want to make a good impression when going out. The Cobb Hill Womens Revchi Dress Shoes have an attractive and feminine design that not only looks great but also can offer you fabulous comfort. The leather uppers of these shoes give you a luxurious feel and make these shoes durable and hardwearing. There is also a velvet lining that will help to reduce rubbing whilst promoting good ventilation whilst you are wearing the shoe. A TPE foot bed provides support for your feet, whilst the memory foam inserts keep your feet comfortable and cushioned. For added traction, the soles of these shoes are made from durable EVA with rubber pads. The pads also offer stability when walking. You can wear these beautiful shoes when you want a casual but smart look and you will feel comfortable and may even experience reduced plantar fasciitis pain when wearing them. 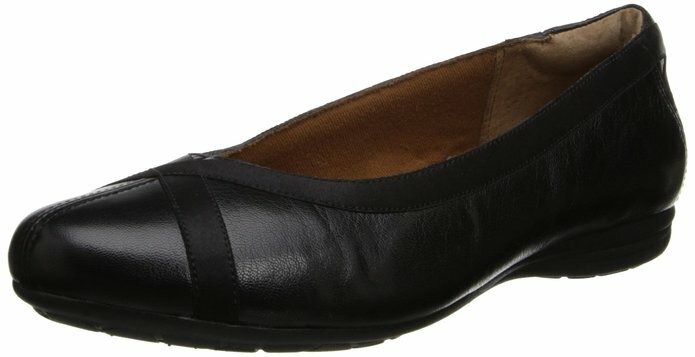 If you are looking for a great low shoe that will give a great impression to your casual or professional appearance, the Vionic with Orthaheel Technology Women’s Cameron Low Wedge Pump is for you. This shoe has a low 1-inch heel and has a classy low-wedge design. The out sole is made from TPR, which is durable and provides flexibility. 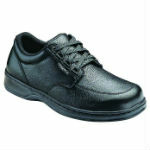 You will notice that the traction that this shoe provides is good for reducing the risk of slips and falls. 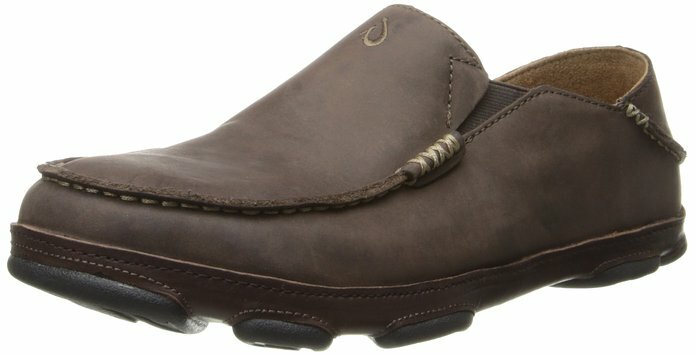 The uppers of these shoes are made from a suede material with a microfiber lining. The lining eliminated odor and makes the shoes breathable and comfortable. Inside the shoe, the foot bed matches to contours of your feet to offer stability and reduces the pain felt from plantar fasciitis. These shoes feature a pump style design with jewel details to the front of the shoe. The high back of the wedge supports your heel and ensures that the shoe will not slip off whilst walking. 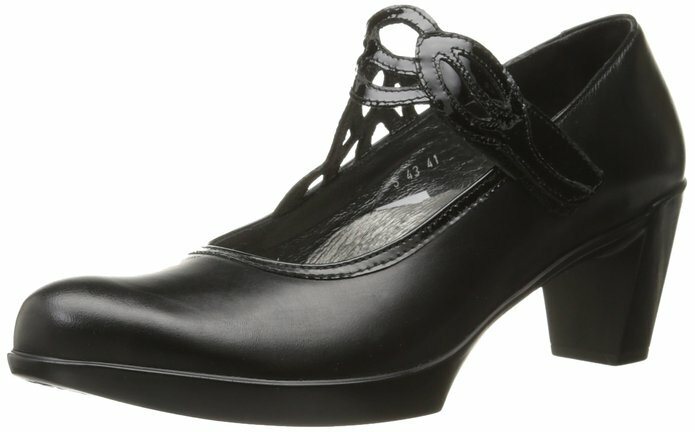 The classy and stylish Taryn Rose Women’s Trulie Dress Pump is a great choice for any woman who wants a feminine heeled dress shoe that she can wear in social situations without having to worry about the pain and discomfort that comes with plantar fasciitis. A combination-flex leather and rubber out sole ensures that you can walk steadily and comfortably with all the traction that you need. Rubber lessens the impact that your feet and heel makes with the floor, which reduces plantar fasciitis pain. The heel itself is not too slim so you won’t need to struggle to balance whilst walking in these shoes. A faceted crystal studded toe provides the finishing touch to these stunning dress shoes. 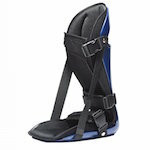 These are fashionably perfect shoes that are also designed with orthotic health in mind. You can wear these shoes for as long as you need to without developing further pain and without the injuries that some heeled shoes can cause. These smart casual Orthofeet Avery Island shoes are a great choice for men who suffer from plantar fasciitis. They fit comfortably whilst looking good too. They can help realign your feet and reduce plantar fasciitis symptoms. You can achieve a perfect fit when you choose these shoes as they have two removable spacers. You can adjust the space in the foot for a better fit. This is perfect if your feet swell due to plantar fasciitis or another foot problem. The soft uppers of these shoes ensure that you can have a comfortable fit. 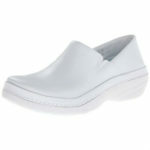 There are no pressure points on these shoes thanks to the softer materials so your feet can avoid rubbing and blisters. A lightweight and cushioned sole ensures that you can comfortably walk around in these shoes all day. The soft and seam free interior and additional foam padding cuts down on the pressure and rubbing that you may otherwise experience against the skin. These smart Vionic with Orthaheel Technology Mens Joseph Dress Shoes are a great choice for men who suffer from plantar fasciitis symptoms. The leather uppers are durable and give these shoes a great look. No one will guess that your shoes are actually specially designed to keep your feet aligned and reduce plantar fasciitis pain. A flexible midsole in these shoes effectively absorbs the impact that your feet make with the floor, resulting in less stress on your feet. The out sole is made from durable rubber and provides you with reliable traction to prevent slipping. The insides of these shoes have a protective upper lining that is padded for comfort. You wont experience any pains from rubbing and you will get a snug fit. Plantar fasciitis has less chance of developing when shoes are held tightly to the heels as this prevents the repetitive motion of the heel that causes the condition. The slip on loafer style of the Vionic Eric dress shoe is perfect if you have difficulty lacing up shoes, or if you simply want convenience. The Orthaheel supportive design ensures that your heel is firmly supported by these shoes, and your feet are kept in perfect alignment. This will reduce and prevent the symptoms of plantar fasciitis. You can comfortably wear these shoes all day if you wish to as they have a padded upper lining. This lining ensures a comfortable fit as well as reduced rubbing. 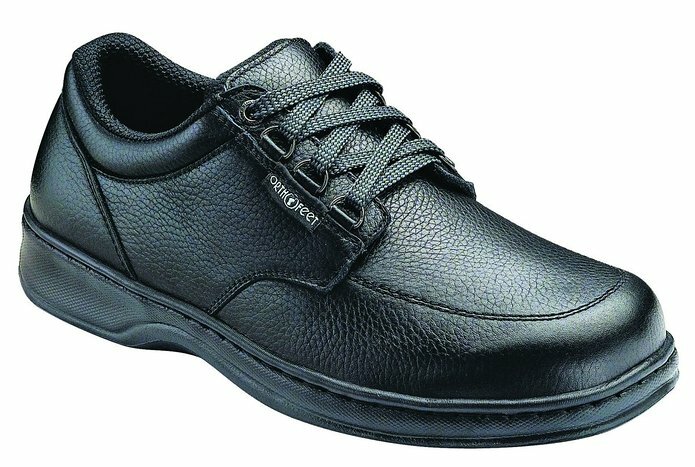 Coupled with the slip on design, this is a great all rounder men’s shoe that will give a professional appearance in the daytime and a smart appearance in your free time. 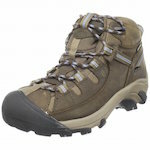 These shoes are also lightweight thanks to an EVA midsole and rubber outer sole. These shoes absorb the impact of walking and reduce the stress felt in your feet when you are on your feet all day. These easy slip-on shoes have been designed to lessen the symptoms of a variety of foot problems including plantar fasciitis. 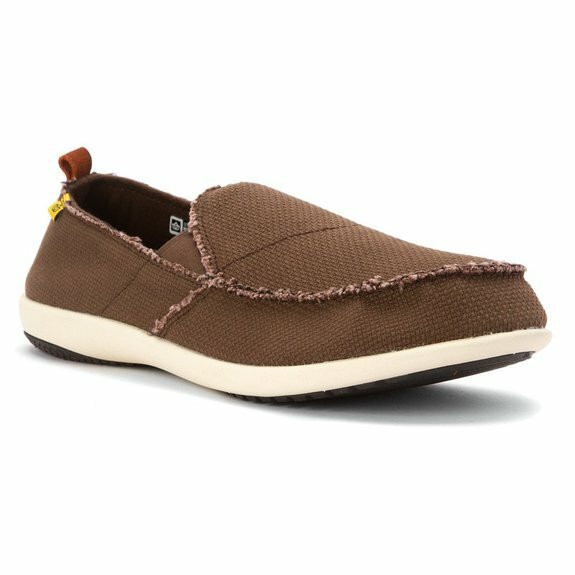 The OluKai Moloa is a cleverly versatile shoe that is perfect for wearing in most settings. 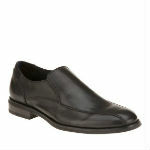 It is one of the best mens dress shoes for plantar fasciitis on the market. 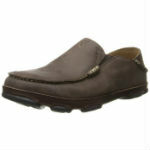 A fold down heel converts these loafer shoes to slip on low back clog style shoes. Whether you want a regular shoe that will be suitable for work, or a more casual style of shoe for warmer weather, you get the best of both with this shoe. The full grain leather uppers of these shoes are naturally waterproof and will keep your feet dry even if you get caught in a rainstorm on the way to your destination. Wherever you are, you can be sure that you will not slip whilst wearing these shoes as the soles have rubber traction pads that wont mark surfaces. The rubber out sole is flexible and durable and is ready for all weather conditions. These smart casual loafers are great for men who suffer from plantar fasciitis. They have a comfortable fabric upper that will not cause sores or pains and a specially designed foot bed and sole that can improve the condition of your plantar fasciitis. The Spenco Siesta Oiled Leather Shoe has a manmade sole and a full grain oiled leather and waxed suede upper. The uppers are naturally waterproof and have a soft and cushioned lining. The lining is antimicrobial to fight off bad odors and keep your shoes as fresh as possible for longer. A zero drop heel lift and deep cupped heel ensures that your heel is as steady as it can be when you are wearing these shoes. This helps keep the pain experienced form plantar fasciitis as low as possible. A compression molded EVA foot bed that is contoured to your feet ensures that your feet are perfectly aligned, further helping to ease your plantar fasciitis symptoms. One of the best things that you can do for your feet to keep them as pain free as possible is to wear a shoe that is comfortable and that fits properly. All these dress shoes are designed to control the pain and symptoms experienced by those suffering from plantar fasciitis and over time, you may even find that your symptoms are altogether eliminated. Both men and women can benefit from choosing shoes that have lighter soles, shoes that have improved traction, foot beds that support and align the foot and materials that are kinder to the foot than more rigid materials. By absorbing the impact when you walk, many dress shoes for plantar fasciitis reduce the stress felt in the feet when walking and can help to lessen the pain and swelling caused by the condition. Check our other guides for different types of shoes that will benefit your plantar fasciitis condition. They include running shoes, tennis shoes, and slippers. We hope that you have fond the best dress shoes for plantar fasciitis for your needs from these top dress shoe reviews.